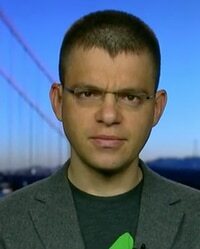 Almost 40 top tech leaders (list, AFTER THE JUMP) released a joint statement today supporting non-discrimination protections for LGBT people to civil rights laws around the country, according to a press release sent out by the group, which was organized by PayPal co-founder Max Levchin (pictured), now CEO of Affirm. Religious freedom, inclusion, and diversity can co-exist and everyone including LGBT people and people of faith should be protected under their states' civil rights laws. No person should have to fear losing their job or be denied service or housing because of who they are or whom they love. Anything less will only serve to place barriers between people, create hurdles to creativity and inclusion, and smother the kind of open and transparent society that is necessary to create the jobs of the future. Discrimination is bad for business and that's why we've taken the time to join this joint statement.